Queen Victoria was born in 1819 at Kensington Palace. By the time she came to the throne in 1837 the whole mood of jewellery had changed. Many styles were never out of fashion while others were tasteless and did not last a season. This Cameo Pendant is made from 22ct gold plated lead-free pewter with a red cameo and is supplied on gold plated chain. The information card is full colour on the front and has historical information on the reverse. Gold Plated pewter priest ring supplied in a clear blister on an information card which describes each of the 3 Egyptian rings available. A pewter frame with a blue and white cameo mounted in the centre, supplied on a quality key chain. Victorian pewter pendant with cameo and supplied on a silver chain. 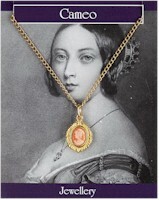 The information on the reverse of the card tells the story of Victoria and jewellery during the Victorian era. Pewter gem ring supplied in a clear blister on an information card which explains about Tudor jewellery and a brief history of Elizabeth I.